A Chat with Tres Masters! Let’s give a warm welcome to our guest for July 7th thru 13th, from Her Master Detective, and the youngest of the Masters triplets, Detective Tres Masters. He has taken a week off from the Braedon, Colorado Police Department to visit with you. Hello everyone, it’s a pleasure to be here. Dos told me about a wonderful woman from the UK who stopped by to visit with him. I hope she’ll say hi to me as well. I also hope a few others of you will stop by too, or it’s going to be a long week. I have to admit, I’m more worried about being cross-examined by readers than my brother, Ace. Maybe if I give you a little of my story, I’ll relax. I was involved in giving testimony in a particularly nasty court case when my life took a left turn. While I was on break from the trial, I ran into my brother Dos who was visiting. That’s when I met Izzy. After that chance meeting, my life turned into a nightmare where I found myself entangled in a web of lies and desire I never would have expected. I would like to ask your opinion about one thing. When we met, Izzy told me ‘wrinkles’ at the corner of my eyes were laugh-lines and she liked them, so I laugh a lot now. What do you think of my laugh-lines? We have the next seven days, until July 13th to visit. I eagerly await hearing from you and can’t wait to see what questions you have for me. Being the youngest triplet, I’ve always been outgoing; let’s face it being third you have to try harder to get attention. After that, you’ll be talking to our BIG brother, Ace. I will do my best to answer your questions, but don’t be surprised if I slip into interrogation or cross-examination mode. 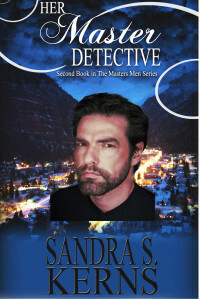 You can post your questions or comments on Sandra’s Facebook (Sandra S Kerns Facebook), Twitter (@SandraSKerns #MastersMen), or here on her blog sandrakerns.com. The Butterfly has been released! The Butterfly Connection was released today, 11/12/13! Woohoo! Is that a lucky release date or what? You can click the icons below if you want to order it now. Tomorrow afternoon, I want to give you time to read some of it, I will start posting clues to the code on the butterfly’s wings. Before we get too carried away with the contest, tell me what today’s consecutive date did for you. Was it lucky or unlucky? Good or bad? Inspiring or scary? Come on, inquiring minds want to know. Besides, I’m sure someone somewhere is getting paid to do a study on this. Let’s give them some data. 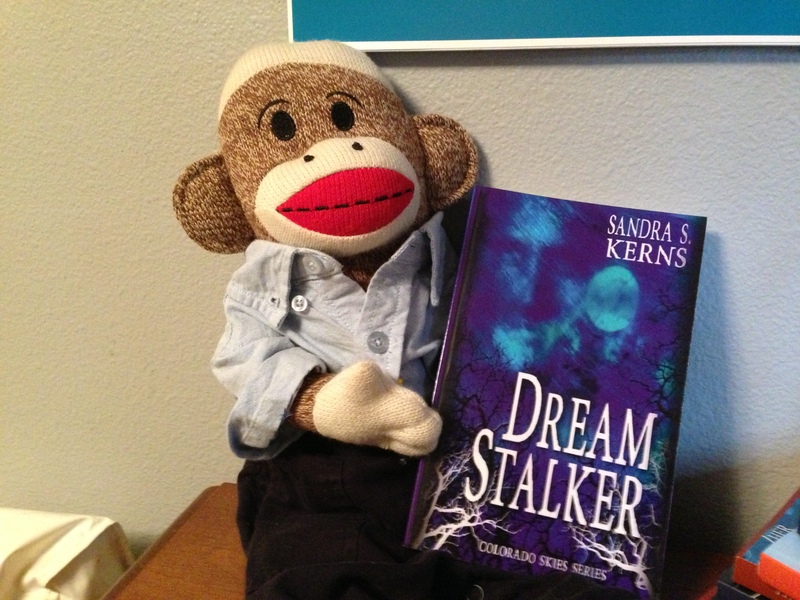 Sock Munkee Jr. is catching up before the next release! Are you excited about the upcoming release, Sock? Are you all caught up with the series? No? well, why not take this weekend to catch up so you know all the players who may appear in the next book. Not sure which books are in the series. Let’s see…. 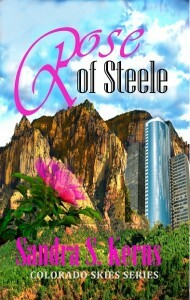 What was the first book in the Colorado Skies Series? Okay, Sock, I gave you that one. Do you remember the 3rd book in the series? 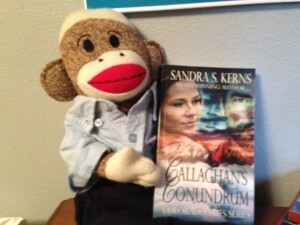 That’s right, Sock, it’s Callaghan’s Conundrum! I ‘ve heard you have a conundrum of your own. Can you tell us about it? Oh, I see, you’re trying to figure out how to read all the stories before the new one comes out. Well, I see some late nights reading in front of the fireplace in your future. Just don’t tell your mom I said you could stay up that late. Here are the links to pick up Callaghan’s Conundrum. Don’t forget, you can pre-order The Butterfly Connection so you can start reading it before anyone else on November 12th! That way you’ll be ready for the contest I’ll be posting on release day. 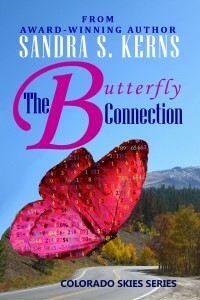 So be sure and check back for a chance to win an autographed copy of The Butterfly Connection and other prizes.